Almost everyone’s heard somebody say, “I can’t help being overweight. It’s my hormones.” There may be more truth to this than we know. Low levels of thyroid hormone may not require medical treatment, but they can cause unwelcome weight gain. Maintaining normal weight is just one good reason to promote thyroid health. A healthy thyroid also supports normal homocysteine and cholesterol levels. It helps maintain healthy nails and skin. Your thyroid can affect your energy levels… and even your moods. Here’s one more good reason to promote a healthy thyroid: Normal thyroid activity is also important for heart health. Fortunately, you can finally do something to support normal thyroid function. 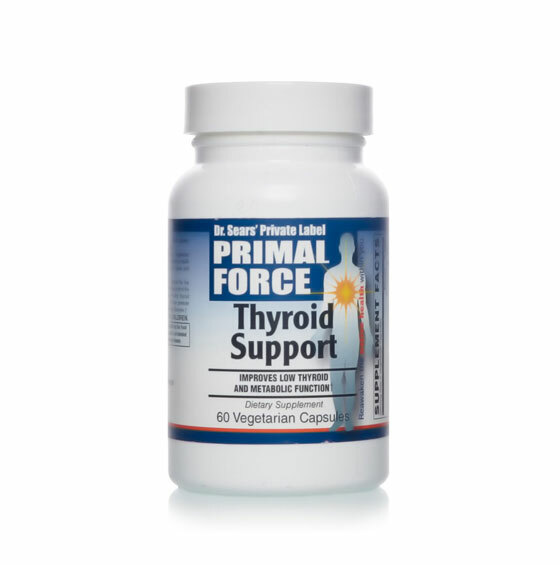 Primal Force Thyroid Support encourages normal thyroid activity by providing the nutrients your body needs to keep this important gland humming. Getting enough of the right nutrients can promote normal thyroid function. And that’s why Thyroid Support provides a natural thyroid supplement that gives you incredible protection. Hard-to find iodine. If you’ve cut your salt intake, you’ve also cut iodine. And iodine for thyroid health is critical. Selenium. This rare mineral supports normal levels of the critical thyroid hormones T3 and T4. Copper and zinc. Animal studies suggest these two minerals are essential for healthy thyroid function. L-Tyrosine. This building block of all thyroid hormones gives your body the raw materials it needs to maintain healthy hormone levels. Plus, Thyroid Support delivers powerful thyroid-boosting herbs and other vitamins and minerals your body needs to promote normal thyroid function. Your body needs to promote normal thyroid function. If a sluggish thyroid is dragging you down… causing you pain… taking the life out of your skin and hair… or even packing on unwanted pounds…Thyroid Support’s balanced nutrition can get you back in the game. Order a 3-month supply of Thyroid Support for just $27.96 per bottle and you’ll also become a member of my exclusive VIP Auto Delivery program. We’ll ship you a fresh, potent supply of Thyroid Support every 3 months. For your convenience, your credit card will be automatically charged with each shipment. That way, you ensure on-time delivery and you’ll never have to take time out of your busy day to worry if you’ll run out. By joining, you also ensure that you receive FREE shipping and handling for as long as you take Thyroid Support! If you’re not satisfied you can get a prompt refund of every dollar you paid. That way, you risk nothing. You’ll receive 3 bottles (a 3-month supply) of Thyroid Support for only $31.95 per bottle plus shipping and handling. You’ll receive 1 bottle (a one-month supply) Thyroid Support for only $34.95 plus shipping and handling.